©MoonConnection.com All Rights Reserved. This moon phases diagram is NOT public domain and may not be used on websites, copied, printed or republished except by permission. Please contact me for high resolution version available for small license fee. The illustration may look a little complex at first, but it's easy to explain. Sunlight is shown coming in from the right. The earth, of course, is at the center of the diagram. The moon is shown at 8 key stages during its revolution around the earth. The moon phase name is shown alongside the image. The dotted line from the earth to the moon represents your line of sight when looking at the moon. The large moon image shows what you would see at that point in the cycle. For the waning gibbous, third quarter, and waning crescent phases you have to mentally turn yourself upside down when imagining the line of sight. When you do this, you'll "see" that the illuminated portion is on your left, just as you see in the large image. One important thing to notice is that exactly one half of the moon is always illuminated by the sun. Of course that is perfectly logical, but you need to visualize it in order to understand the phases. At certain times we see both the sunlit portion and the shadowed portion -- and that creates the various moon phase shapes we are all familiar with. Also note that the shadowed part of the moon is invisible to the naked eye; in the diagram above, it is only shown for clarification purposes. Finally, please realize this diagram is only meant to demonstrate how the phases work; the small inner moons in the diagram do not show the fact that the same side of the moon always faces Earth. So the basic explanation is that the lunar phases are created by changing angles (relative positions) of the earth, the moon and the sun, as the moon orbits the earth. If you'd like to examine the phases of the moon more closely, via computer software, you may be interested in this moon phases calendar software. 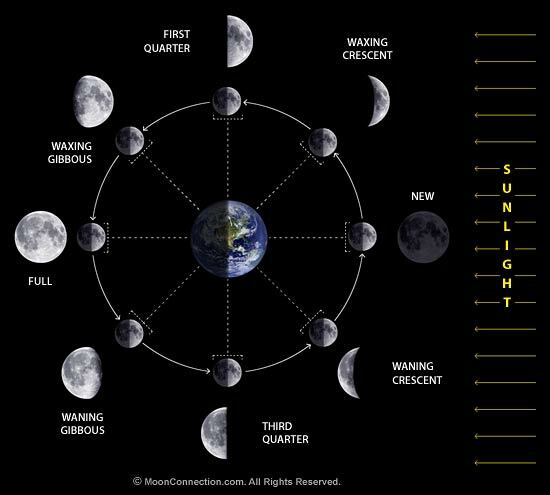 It's probably easiest to understand the moon cycle in this order: new moon and full moon, first quarter and third quarter, and the phases in between. As shown in the above diagram, the new moon occurs when the moon is positioned between the earth and sun. The three objects are in approximate alignment (why "approximate" is explained below). The entire illuminated portion of the moon is on the back side of the moon, the half that we cannot see. At a full moon, the earth, moon, and sun are in approximate alignment, just as the new moon, but the moon is on the opposite side of the earth, so the entire sunlit part of the moon is facing us. The shadowed portion is entirely hidden from view. The first quarter and third quarter moons (both often called a "half moon"), happen when the moon is at a 90 degree angle with respect to the earth and sun. So we are seeing exactly half of the moon illuminated and half in shadow. Once you understand those four key moon phases, the phases between should be fairly easy to visualize, as the illuminated portion gradually transitions between them. An easy way to remember and understand those "between" lunar phase names is by breaking out and defining 4 words: crescent, gibbous, waxing, and waning. The word crescent refers to the phases where the moon is less than half illuminated. The word gibbous refers to phases where the moon is more than half illuminated. Waxing essentially means "growing" or expanding in illumination, and waning means "shrinking" or decreasing in illumination. After the new moon, the sunlit portion is increasing, but less than half, so it is waxing crescent. After the first quarter, the sunlit portion is still increasing, but now it is more than half, so it is waxing gibbous. After the full moon (maximum illumination), the light continually decreases. So the waning gibbous phase occurs next. Following the third quarter is the waning crescent, which wanes until the light is completely gone -- a new moon. You may have personally observed that the moon goes through a complete moon phases cycle in about one month. That's true, but it's not exactly one month. The time required for the moon to move to the same position (same phase) as seen by an observer on earth is called the synodic period or lunation and it is 29.5305882 days on average (+/- 0.27 days due to the varying distance between the earth and the moon). If you were to view the moon cycling the earth from outside our solar system (the viewpoint of the stars), the time required is 27.3217 days, roughly two days less. This figure is called the sidereal period or orbital period. Why is the synodic period different from the sidereal period? The short answer is because on earth, we are viewing the moon from a moving platform: during the moon cycle, the earth has moved approximately one month along its year-long orbit around the sun, altering our angle of view with respect to the moon, and thus altering the phase. The earth's orbital direction is such that it lengthens the period for earthbound observers. Although the synodic and sidereal periods can be used in certain calculations, the moon phase can't be precisely calculated by simple division of days because the moon's motion (orbital speed and position) is affected and perturbed by various forces of different strengths. Hence, complex equations are used to determine the exact position and phase of the moon at any given point in time. Also, looking at the diagram (and imagining it to scale), you may have wondered why, at a new moon, the moon doesn't block the sun, and at a full moon, why the earth doesn't block sunlight from reaching the moon. The reason is because the moon's orbit about the earth is about 5 degrees off from the earth-sun orbital plane. However, at special times during the year, the earth, moon, and sun do in fact "line up". When the moon blocks the sun or a part of it, it's called a solar eclipse, and it can only happen during the new moon phase. When the earth casts a shadow on the moon, it's called a lunar eclipse, and can only happen during the full moon phase. Roughly 4 to 7 eclipses happen in any given year, but most of them minor or "partial" eclipses. Major lunar or solar eclipses are relatively uncommon. If you want to follow the phases of the moon, you should definitely take a look at QuickPhase Pro, our flagship moon software product for your personal computer. This attractive and fun software covers thousands of years of past and future moon phases and is easy to use.